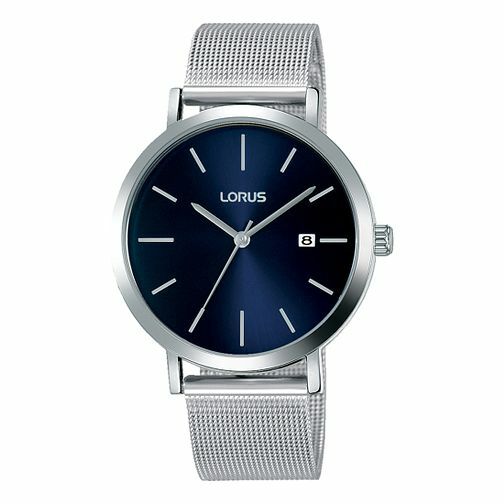 This men's dress sunray blue dial watch from Lorus features a date display, silver baton hour markers and hands, and a stainless steel mesh bracelet. This watch is also splashproof. Lorus Men's Blue Dial Stainless Steel Mesh Bracelet Watch is rated 4.5 out of 5 by 2. Rated 5 out of 5 by Anonymous from Brought for the other half Brought this got the other half as he wanted a smart watch for work. Looks loads more expensive than it is and he loves it! Rated 4 out of 5 by Anonymous from looks an expensive watch I bought this for my brother and he is very pleased with the watch. he says it looks very expensive and classy. said the blue face looks good on silver.